CdTe Module « Global Market Insights, Inc. The global solar PV glass market is gaining remarkable momentum with escalating investments toward boosting energy efficient technology and conserving the energy mix. Favorable government initiatives and projects toward the usage of clean energy sources to reduce carbon footprints have brought about huge growth prospects for solar PV glass industry over the coming seven years. 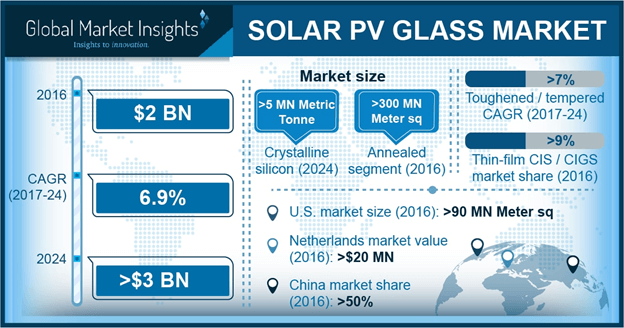 In 2016, global Solar PV glass market was worth over USD 2 billion and the overall consumption is projected to cross 700 million square meters by 2024, according to a report by Global Market Insights, Inc. The photovoltaic glass is widely used to concentrate sunlight and convert the solar energy into electric energy. Using solar PV cells and glass in building facades and roof lighting systems can result into economical use of solar energy. PV glass can thus be directly used for power generation for small scale sectors. In countries such as the U.S., the government has introduced rebates and subsidies for the installation of solar PV glass. It has also initiated policies such as Investment Tax Credit (ITC), which has significantly reduced the overall cost of the product to boost its adoption. As per a report by EIA, the U.S. boasted of a total installation of over 12.6 GW of solar PV systems in 2016, chiefly for the residential sector. The rising demand for solar PV glass across the residential sector has provided a significant impetus to the tempered/toughened solar PV glass market. This product segment provides better thermal stress breakage and mechanical strength to the glass and is therefore safer than its counterparts. The tempered solar PV glass market is thus likely to witness a lucrative growth of 7% over 2017-2024. China is a major consumer, producer, and exporter of photovoltaic systems and accounted for more than 50% of the overall solar PV glass market in 2016. In December 2016, the Chinese government amended its Thirteenth Five Year Plan to improve the countries photovoltaic energy sector with an aim to achieve at least 23% of efficiency in large scale production of crystalline silicon photovoltaic cells by 2020. UK solar PV glass industry has also been gaining traction of late. In 2016, the UK government proclaimed a complete phase-out of the standing coal fired stations by 2025. Moreover, stringent government regulations for curbing the carbon emissions has resulted into several government initiatives to install rooftop solar PV units, which is turn has raised the regional share for solar PV glass industry. On the technology front, solar PV glass market is segmented into two types namely float and pattern. The pattern solar PV glass market share is expected to depict an annual growth rate of 6% over the period of 2017-2024, owing to its better aesthetics, easy lamination, non-blinding effect, and desired degree of transparency. On other hand, the float solar PV glass industry also holds a significant market chunk as it finds extensive applications in thin film photovoltaic modules. Solar PV glass market from thin film CIS / CIGS segment is likely to register a CAGR of 9% over 2017-2024. Moreover, the use of low iron pattern and float glasses for manufacturing crystalline modules has considerably impelled the solar PV glass industry. The global solar PV glass market is likely to witness strategic collaborations and mergers to expand their network across different regions. Prominent industry players include Guardian Industries, Vidur Glass, Guangdong Golden, Xinyi, Sunarc Technology, Jin Jing, Borosil, and Flat Group. This entry was posted in Sustainable & Smart Technologies and tagged Amorphous Silicon, Annealed, CdTe Module, CIGS Module, Crystalline Silicon Module, Float, Global Solar PV Glass Market, Pattern, Solar PV Glass Market, Solar PV Glass Market Analysis, Solar PV Glass Market Forecast, Solar PV Glass Market Growth, Solar PV Glass Market Growth Rate, Solar PV Glass Market Report, Solar PV Glass Market Research, Solar PV Glass Market Segmentation, Solar PV Glass Market Share, Solar PV Glass Market Size, Solar PV Glass Market Trends, Tempered, Thin-Film CIS, Toughened.